Among the peace activists are two Israeli-American citizens, and 19 others, including five from Ireland, three from Britain, five from Bahrain, three Americans, and Danish, Jordan, and Yemenite citizens. Eight immigration police arrived at Ashdod police and performed a search of the activists' belongings. The detainees will then be transferred to the Immigration Administration in Holon. The police will take their fingerprints, and then send them to Ben Gurion Airport, where each one will face a hearing before the Interior Ministry before being deported. Hana Araf, of Meilia village in the Galilee, uncle of Houida Araf, one of the Israeli-American citizens on the Gaza-bound boat said, "We haven't managed to get a hold of her, and we haven't received any information. We are worried. They can't deport her, and we will fight for this to the very end. "She has an Israeli passport. She is a citizen of the state, and Israel has no right to detain her. What for, exactly? For trying to help people who have no food? In the past there were a few regimes that did this, the apartheid in South Africa, for instance. Is this the regime Israel wants to be associated with?" According to him, "She didn't do anything against the law. She wants to lawfully help people in trouble, and they are part of her people – if the people here in Israel want it or not. I don't know how in 60 years, people haven't internalized the fact that the Arabs living here are Palestinians. We are the same nation. The fact that there was separation and occupation doesn't make us any less brothers." In Larnaca, Cyprus, where the boat departed from, the Gerta Berlin, founder of Movement for the Freedom of Gaza, is being inundated with phone calls showing their support following the detainment of the peace activists. "They simply kidnapped the passengers. I call the Israeli occupation forces to release our people immediately. It's funny – what are they going to do? Deport us? The last place we wanted to reach was Israel," she said. Berlin still has not thrown in the towel. "It isn't over till the fat lady sings. They took our boat, so we'll get a freighter. Israel has no right to keep 1.5 million residents under siege, to occupy Gaza, and to turn it into one big refugee camp. "The Israeli government does not understand that time is on our side. In the meantime, the administration is losing public support. It would be much smarter on their part if they would simply turn the other cheek and let us through. The detainment of the boat only works in our favor in the long run," she explained. 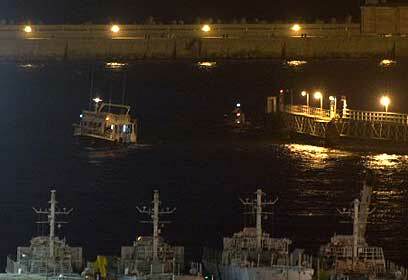 See all talkbacks "Israel to deport peace activists sailing to Gaza"